All FullCure 3D printing materials are delivered in fully sealed, 2kg or 3.6kg cartridges, ensuring environmentally safe use without any skin contact. 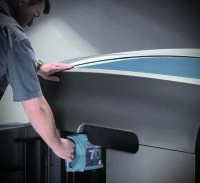 Loading and unloading is similar to the process of installing and removing inkjet cartridges from a paper printer. The 3D printer cartridges are easily separated and disposed off. The cartridge shells snap together, enabling easy removal.